Link: Short explanation of my work and documentation of the exhibition at Kunstmuseum Solingen, 69th "Internationale Bergische Kunstausstellung"
Video: (GER) Television: documentation and interview [Look at 1 minutes and 40 seconds]. For me as a sculptor it was a logical conclusion to take a camera and capture real and tangible spaces. In this process, I created some forest series. The multiple exposure of my older photograms led me to use the same procedure with analogous and digital formats in order to intensify the effect and to enrich the pictures with new facets of impact. For me as a sculptor, the idea of whether it was possible to translate the stylistic idiom made up by photography into sculpture was very interesting and motivating. After an almost 10-month research period, I developed a solution with the help of RWTH Aachen and some industrial companies, which I entrusted with the technical fulfillment of the project. I decided to use a mathematical method to convert the brightness values of the single pixels of digitalized photography into a height profile. A CNC milling machine then carved the form out of a material block. However, a lot of digital sculptural work is necessary to create a file suitable for the milling process. 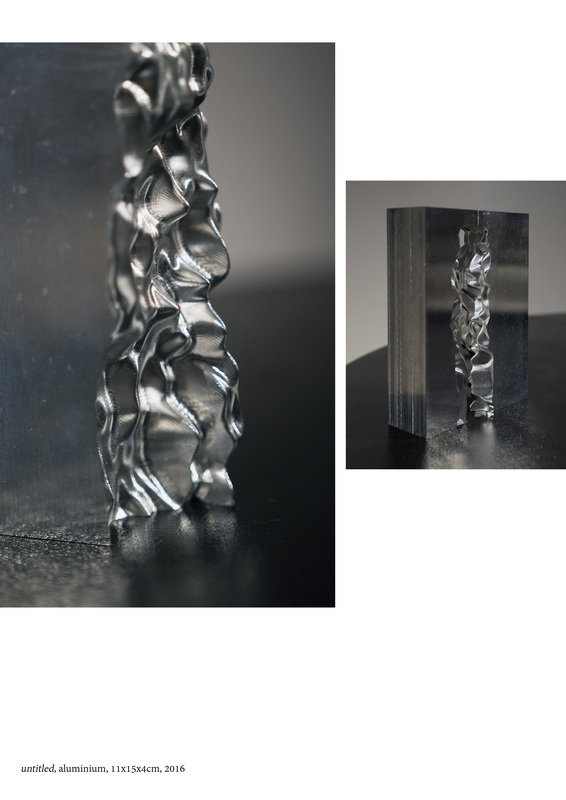 The submitted aluminum sculpture (untitled) was created in 2016 as a result of a digital process which was targeted at producing a spatial body on the basis of an analogous picture. In the enclosed rendering (untitled) from the year 2015 it is the right body. In a second step, further transformations as positive/negative were created, which can be seen in the enclosed rendering (untitled) on the left side. For later implementation, the work is purposed to be in the open air. This will open the way for people to stride through it. Thus, sculpture is transformed on the ground of human dimension, that is architecture. Space is defined by the digital development of a negative plastic, starting from a positive mold (see enclosed Styrofoam version). It is this oscillation between digitality and analogity - between immaterial and material - that interests me. Limitations set by the genre are to be overcome by my work. The effects of this new step into working across genres is what I am determined to bring forth. Light and shadow shapes that manifest themselves in the material through their concave and convex shapes always changing through time, weather conditions and our entire environment remain recognizable in their effect, similar to the initial condition of photographed space, the forest.